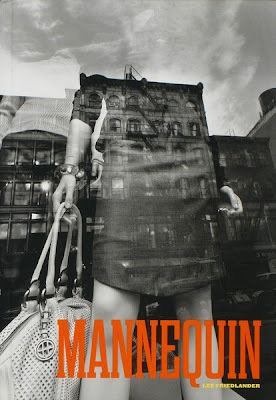 For fans of Lee Friedlander, his recent book Mannequin offers good news and bad. The good news is that the master has returned to the 35 mm format with which he established his reputation during the first half of a sterling career. The bad news is that he appears sorely out of practice. I'm not sure what's going on. Perhaps years of shooting Hasselblad have permanently shifted his vision away from the rectangular. Or maybe he's just old and tired. Whatever the reason, the resulting photos are dull and formulaic. Instead of capping a career with a bang this publication is more of a whimper. 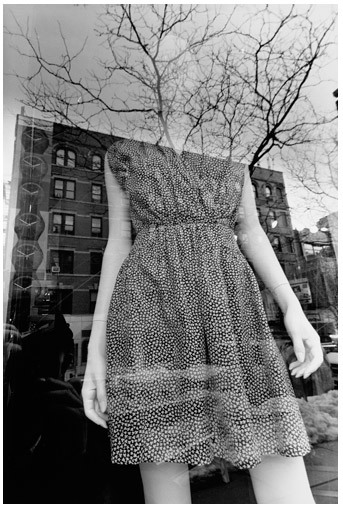 Shop-window mannequins are one of the great clichés in street photography. Perhaps the temptation to revisit and add to a seemingly tired form is what attracted Friedlander. It's been shot to death, but is it dead? Just to be sure Friedlander shot it several more times for good measure. There's no risk of these bullet ridden corpses rising again. Most photos in the book follow a similar pattern, juxtaposing a building's reflection with a mannequin behind plate glass. Again and again this motif is repeated until it verges on typology. But to what end? For me one or two such photos would express the idea adequately. The book has 103. If I seem to come down especially hard on Friedlander it's only because I hold his earlier work in such high esteem. He is probably the single most influential photographer for me. For many years he has been as prolific, unmoored, and curious as any shooter out there. But what attracted me most to his earlier work was its playfulness. There was a sense of absurdity and deeply surreal humor which revealed a wise soul behind the lens. Time and again he injected that playful spirit. It's so vital and so rare! Try to find a playful spirit in any contemporary art photographs. Go ahead. I dare you. But sadly Friedlander offers no respite. His new work does not show the old spark. For me this has been building for the last several years. Even as Friedlander's pace of publishing has increased —to a rate of 2+ books per year recently— I've found it more difficult to follow his whims. Like any good student I've studied each new book thoroughly, but with mild interest, more out of duty than passion. The sad fact is that I've begun to view these books with the same growing suspicion with which I view much contemporary photography. Could it be that the emperor has no clothes? Until now I've given Friedlander the benefit of the doubt, but Mannequin heightens my suspicions. The book is published by Fraenkel in conjunction with a recent gallery exhibition. Jeffrey Fraenkel has tirelessly championed Friedlander for decades. I can't help wondering what he must have honestly thought of the work when Friedlander first brought it to him. Were they really "unsettling and radically new compositions." Was Friedlander really "working at the height of his powers." Perhaps Fraenkel really thought so. The more cynical view is that he realized the work was half-baked yet chose to release it anyway, knowing that any book with Friedlander's imprimatur was guaranteed to sell. In any case no amount of fawning copy is going to breath life into these photos. I'm very sorry to report that they are as static and lifeless as any shop-window mannequin. With Friedlander, for me the joy is the opportunity to see through his precise, particular and practiced eyes. And then—if it's not crystal clear—to ask, Why? Why this particular perspective, angle, point of view? Why THIS shot? What, exactly, did Friedlander see that prompted him to make this exposure? What choices did he make that make THIS picture, in his estimable estimation, complete, interesting and worthwhile? And when I don't see it I figure I'm missing something, not that he did (the nudes have impressed more over time, for example). As I study it some (after a quick glance)... 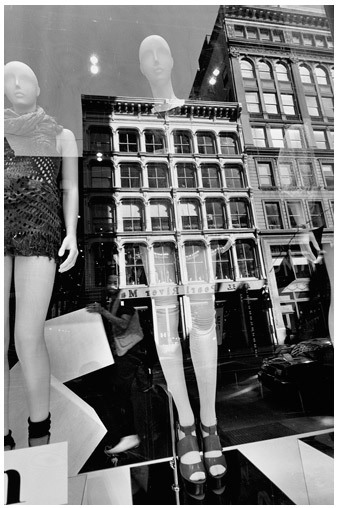 In the third picture here, the alignment of the central mannequin's legs with the lower windows of the reflected building; that building serving as a boxy, gridded frock—how fashionable!—and those interior lights glowing equidistantly on either side of "her" head would be enough to make this a keeper. But it's a Friedlander. So we also get a person passing by inside carrying a composition capping white square (I'll call it). Finally, a tip of the camera to assure its balance, and Bingo! I assume you saw something in it too or you wouldn't have featured it. And, since I haven't seen the book's complete contents yet, I can't say that the bulk of the others aren't enough-already! as you suggest. But I continue to give Lee Friedlander the benefit of the doubt. In fact I'm grateful that he remains, as ever, ready, willing and eager! to see all that he can see in a given subject. To my mind, he is still fully and regally attired. But this is "B," not "D." And, although I'm reluctant to be any more disagreeable than I have been (I Love This Blog!) I have to say that I find Abelardo Morell's work to be generally delight-inducing and, yes, even playful. But, again, that's (hero-worshippy? guilty) me. He did a bad choice of a subject. I agree with everything you say Blake. He seems to be padding his estate since Sticks and Stones. And yet...I think the last picture above is great. Interesting comments. One thing I thought of after writing this was the natural comparison to Friedlander's first book Self Portrait. Many of the photos there play on reflective plate glass trickery like Mannequin pix. But for whatever reason those photos really appeal to me. They seem more playful and experimental, just a guy walking around noticing himself, but without following any strict typology. Like all his work- needs some (ahem!) editing, otherwise, couldn't disagree more. Going from print to print, I was amazed by the surrealist little worlds of wonder he was able to create over and over and over again. I think it's such tired subject matter because pretty much everyone at some time tries it and eventually gives up after they can't make work what they thought was easy. FWIW, the beauty of the reflections, so crucial to the subject matter and its appreciation, are somewhat nullified in the more gritty reproductions of the book. It takes great courage and honesty to shout out loud that the emperor is naked. I'am afraid, as you suspect Blake, that this has been the case for a while now. What Freedlander does is simply capitalizing without shame on his reputation (as many others like him do also, eg Eggleston)taking out inferior work that any modest or unknown photographer wouldn't dare to. I saw the show at Fraenkel and passed on the book, having some of the same thoughts as you, Blake. My initial response was, "This does not look like new work". Throughout his career, he has marched through genre after genre, nearly always giving the subject a drastically new look while maintaining a consistent thread of authorship. There have always been images that loop back to earlier work, but with this group he seemed to have taken the time tunnel right back to1966. Do you think the obvious and thorough return to earlier forms (35mm, urban street scenes) has hindered us from seeing the new in these? I may purchase the book after all and give it some more consideration. It is Friedlander. If the work really doesn't measure up to his best, well, who has done better at keeping us interested over so many decades? Old Neil Young has put out a couple of stinkers over the years, but it hasn't diminished the best of his work at all. FYI, This week's issue of the New Yorker has a mini "Portfolio" of a hand full of these pictures. And (file under meaningless trivia) on the following page, a nice little short story by Tom McGuane (old friend of Jim Harrison's who Friedlander has often quoted in his more recent books). Self-parody is a constant danger to anyone who has a substantial body of work under his/her belt. It creeps into one's vision unnoticed, essentially invisible. It is, after all, your style. If you are successful, and make money for others, few will call you on it. However, I think that it is, often, a necessary phase in finding one's way forward. Friedlander's career has been remarkable in that he has continued to work and grow as an artist over a lifetime. It has not been a straight line. Many, for various reasons, shine brightly and fade out. Others, like Friedlander remain vital into old age. I agree that this series falls short. But, can you believe it?The guy is still out there shooting!